Yes, this is a fashion post but I feel the need to tell you how we got to this location. Bear with me. Last weekend we played tourist in our own city. 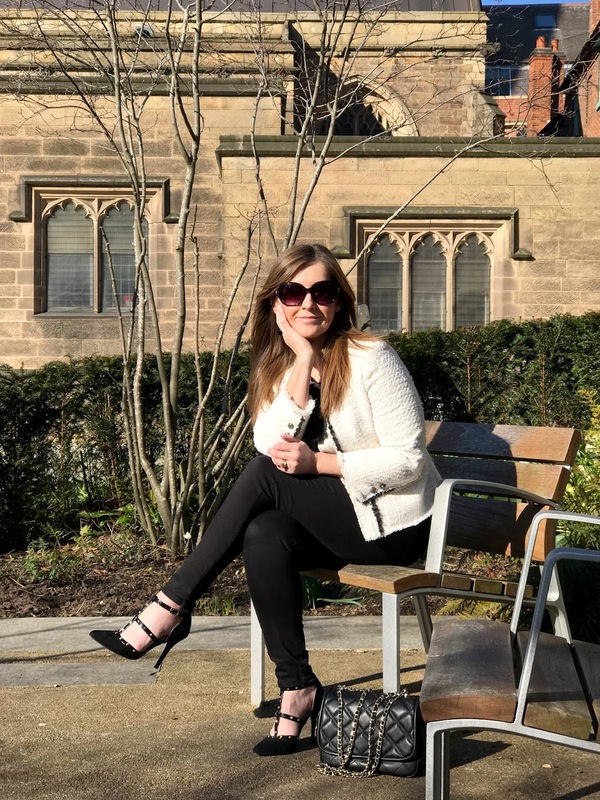 When I say tourist, I mean we went along to the Cathedral, we've never been despite living in Leicester our whole life, paid our respects to Richard III, got a bite to eat and had cocktails. We didn't plan any of this which was the nice thing, it just happened. We have a small town close by and that's generally where we'll go if we need anything, only going into the main city centre if we have to. Well, last Saturday we had to, to get some glasses for Nick, he needs glasses for driving, TV and reading, yep it's an age thing, and on the way back to the car Nick suggested we get some lunch somewhere. We ate at Mrs Bridges, a cute little cafe on the lanes that's been there for donkeys years, then headed off to the Cathedral which is just a 5 minute walk. We've passed the cathedral a million times but never been in. I'm a bit embarrassed to say that because we have a king buried there for goodness sake! The whole world knows about the discovery of Richard, buried in one of our car parks he was and then reburied in Leicester Cathedral in March 2015. We have a steady influx of tourists now which is wonderful for the city and the area surrounding the cathedral is getting better and better with more restaurants, cafes and bars. Our city as a whole has so much to be proud of, history, discovery and legends. I wrote a post in more detail about the city, it was when we won the Premier League, go have a read because I think you'll be quite surprised to see what Leicester is famous for. The link is right here. We were heading home after the cathedral but then I remembered a lovely bar I'd been in recently called The Bottle Garden so twisted Nicks arm [didn't need that much twisting!] to go in for a swift one. It was whilst in there we decided to come back into town the next day to the same location, just outside the cathedral to take some outfit shots. Finally brought it back round to the fashion. We popped back in Sunday morning to shoot this jacket. A jacket I've had for like ever, well, since last year, and meant to take photos of but for one reason or another I never did. I know the saying is better late than never, and whilst that is true, I hate to say it but you can't get this particular jacket now. A thousand apologies. I'm showing it though because the style is still very much on trend. Along with breton tops and the trench this Parisian boucle style jacket will always be around. 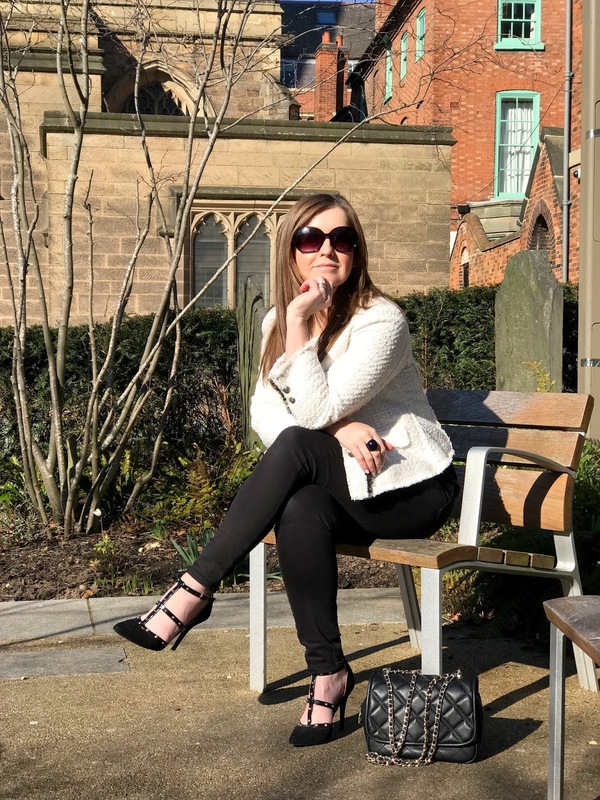 Introduced by Coco Chanel in 1954, originally worn with a wrap skirt and a string of pearls, it's a timeless and classic look, just look at how long it's been around and it's a look that can be worn by anyone. 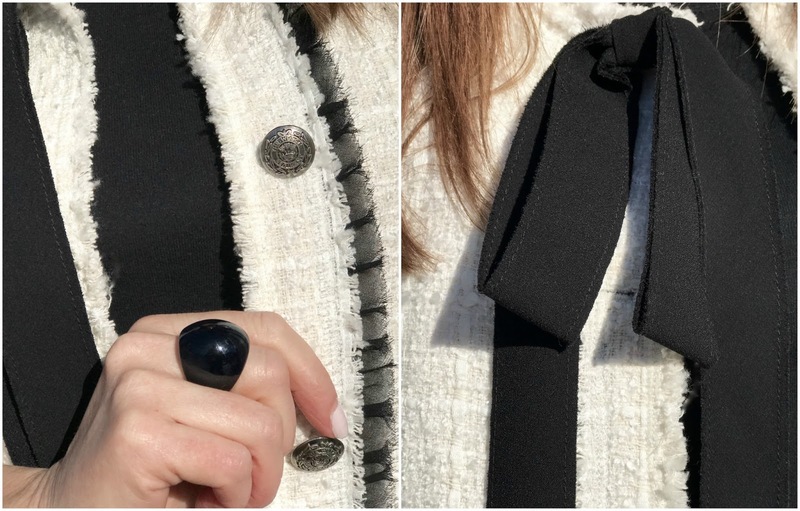 The jacket was inspired by menswear, straight and fluid, buttons stamped with the Chanel logo and a thin delicate chain sewn into the lining making it fall perfectly. I believe they still do this today, but don't quote me on that! 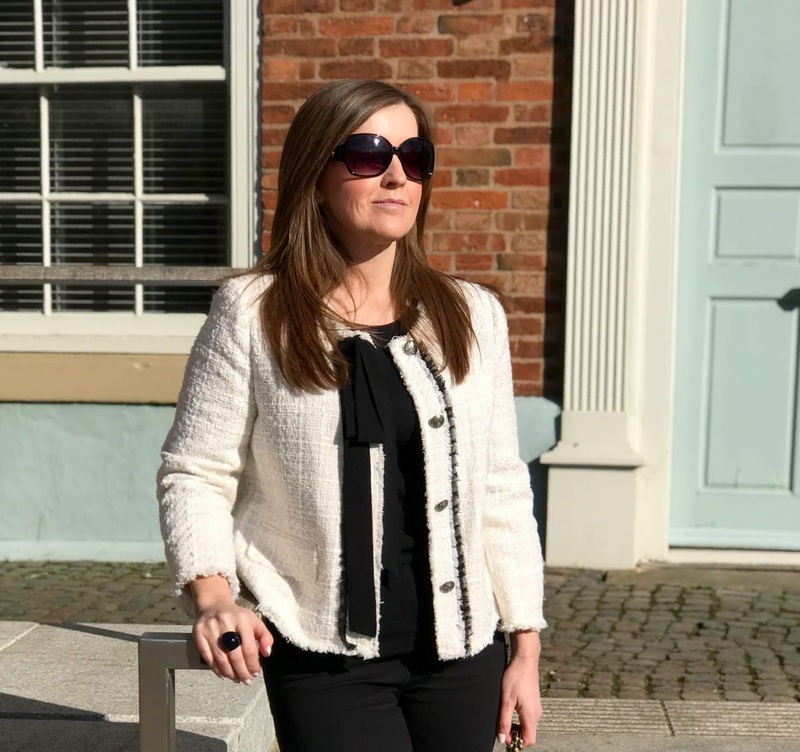 Whilst a Chanel jacket is out of reach for the majority of us, fear not, there are many brands doing their own version and you don't have to spend a small fortune. You can dress it up with trousers or of course a classic skirt but the more modern way is to pair it with jeans. 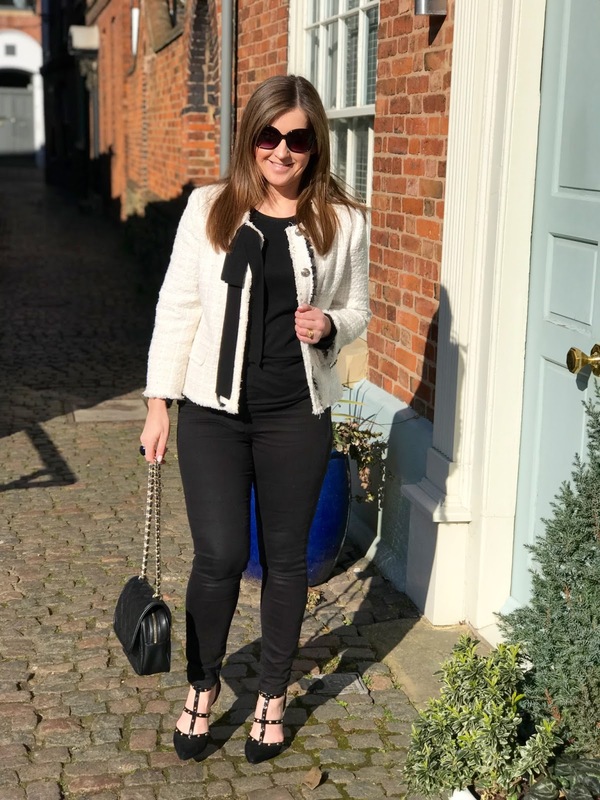 I'm wearing mine with black skinnies but regular denim works just as well, in fact I think that's my favourite item to pair this jacket with because it has such a casual, relaxed vibe. The jacket feels great on and I love the detailing with the buttons and the bow. Although it was a nice sunny day when we shot these, jeez it was freezing. I can't wait for spring to get here so I can finally get some wear out of it. It's a versatile piece to have in your wardrobe for spring, something slightly different from the blazer. I got my jacket from Zara and whilst they don't have this one now they have this similar box style jacket or there's this one from Forever 21. I've also linked a good selection below for you to have a look at. I love this style of jacket, it's so versatile and always looks stylish. Zara have fantastic jackets, and they really hold their value on eBay. It's funny how we overlook the attractions on our doorstep. I'm from Peterborough and Catherine of Aragon is buried in the cathedral - it's a magnificent building but rather hidden from view from the main shopping area. I love to have a wander around it when I'm back home visiting my mum. Thanks for linking up Steph!